In 1775, a ragtag band of explorers called "long hunters" reached the banks of a meandering river in the Kentucky territory, where they carved their names on beech trees to mark their passage through this vast wilderness. Their explorations had led them to a fertile land that was nourished by numerous rivers and streams, blanketed with thick forests, and composed both of gently rolling hills and rugged, rocky terrain. Within a few years, the long hunters would be followed by the hardy pioneers who attempted to establish more permanent settlements. The first, McFadden's Station, was located on the north side of the newly named Barren River in 1778. Robert Moore paused for a few days at the rough-hewn station in the early 1790's before continuing to his own homestead. He built his cabin alongside a large spring at what later became Bowling Green. For a time the Revolutionary War, raging along the eastern seaboard, slowed the expansion of white settlements beyond the Appalachian Mountains. But by 1792, the Kentucky territory had entered the new United States as the 15th state, and within four years, land grants in the remote area first encountered by the long hunters were offered to Virginia's Revolutionary War veterans, many of whom brought slaves and indentured servants with them. They quickly set about the difficult task of carving out a toehold of civilization in the enormous wilderness. The following year, the Moores offered an additional donation of more than 30 acres for the creation of a town to surround the recently constructed public buildings. At the first county commissioners meeting in early 1798, the pioneers decided that the new town would be "called and known by the name of Bolin Green." This name was after the Bowling Green Square in New York City, where patriots had pulled down a statue of King George III and used the lead to make bullets during the American Revolution. Within only a few decades, Bowling Green was established as a commercial and transportation center for the South Central Kentucky area. After a brief competition with the small Jeffersonville and New Town settlements alongside the Barren River, Bowling Green gained the official designation of county seat in 1809 and incorporated in 1812. 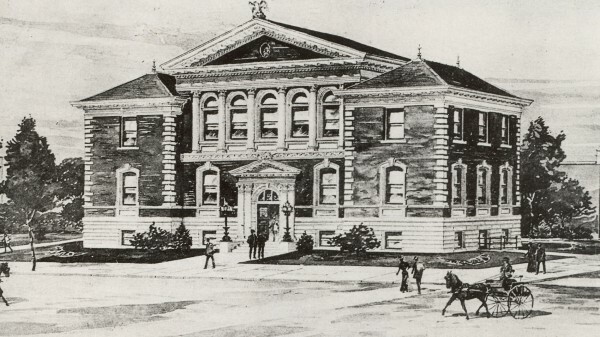 In 1821, the Bank of the Commonwealth established a branch office in the town, creating important commercial ties with the rest of the state. By the late 1820's, Bowling Green expanded to include a locally owned and printed newspaper (Spirit of the Times), a doctor's office, a private school for boys, a Masonic lodge and several churches. 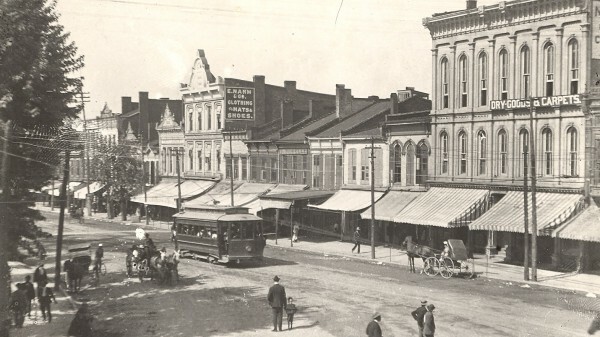 Stagecoach lines connected the town to Louisville, Nashville and Hopkinsville, while flatboats carried tobacco, hams, whiskey and farm produce down to New Orleans. Ambitious business leaders, such as James Rumsey Skiles, were instrumental in ensuring Bowling Green's success as a commercial center in the region. During the 1830's, their locally owned stock companies funded the clearing of snags from the Barren River to improve its navigability and the construction of the Portage Railroad to connect the docks to the center of town. Having demonstrated their determination, they then lobbied the state Legislature to fund additional improvements, including the construction of several locks and dams. Agriculture provided the town's economic base, with the main trade products being tobacco, hay and livestock. Paddle wheelers and steamboats began to traverse the Barren River with increasing frequency, while the completion of the Louisville and Nashville turnpike in 1838 further strengthened Bowling Green's ties to the rest of the region. By the 1840's, as the trappings of civilization continued to expand rapidly, Bowling Green was no longer a lonely settlement in the midst of a vast wilderness. In 1842, Joseph I. Younglove and A. Starr opened a drugstore in the Thomas Quigley building at the corner of Main and State streets, and under various ownership a drugstore remained at this location until 1980. The Marshall House Jewelry Store opened in 1847, indicating the increasing wealth of local residents. Meanwhile, shipping excursions to Louisville by steamboat, expeditions to the exotic and mysterious Mammoth Cave, and picnicking at Beech Bend offered a variety of entertainment. By the late 1850's, Bowling Green boasted several manufacturing facilities as well, including an iron foundry, woolen factory, candle factory and several flour mills. Finally, a number of prosperous planters' estates had been firmly established on the outskirts of town, including Sen. Joseph Underwood's Ironwood, James Skiles' Kinloch, and John Clark's Boxerwood. these houses continue to stand today, only a few of the enduring reminders of Bowling Green's successful transition from a rudimentary pioneer settlement to a thriving commercial center. Article written by Lena Sweeten. Reprinted with permission from Bowling Green Magazine and Journal Communications, Inc.